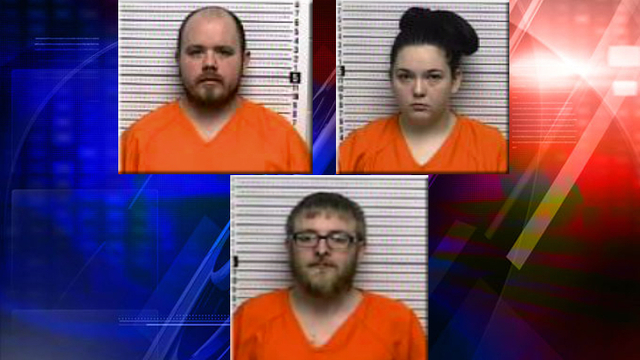 Three arrested after child found wandering streets in Muhlenberg Co.
A child wandering the streets alone in Muhlenberg County leads police to a Greenville home, and the arrest of three adults. Greenville Police say they were alerted to an unattended four-year-old child in the area of Highland Drive. A neighbor called 911 after witnessing the child walking alone around 10:00 Tuesday morning. Officers say after locating the child's home, they found three adults and two other children inside. They also say they found marijuana and drug paraphernalia in the home. The child's father and mother, 29-year-old Joseph Gunnels and 26-year-old Amber Gunnels were arrested. A third person, 25-year-old Gage Duncan, was also arrested. All three face charges of Endangering the Welfare of a Minor, as well as drug charges. The three are now lodged in the Muhlenberg County Jail. The Kentucky Cabinet for Health and Family Services is involved in the case.